Our deck project in Clive, Iowa. Decks are where it all started for us almost 16 years ago. We had a passion for carpentry and creating unique pieces for clients that were built to last. We still have that same passion that we put into all your living spaces in and around your home. A deck is an outdoor living space often elevated from the ground, and usually connected to a building. Wood or timber “decking” can be used in a number of ways: as part of garden landscaping, to extend living areas of houses, and as an alternative to stone based features such as patios. Decks are typically made from treated lumber which is lowest in cost, cedar which is higher in cost than treated, composite which is the most expensive option other than exotic hardwoods but also is the longest lasting. Whichever option you choose Compassion Builders can build you the deck of your dreams. The above photo shows a deck we designed and constructed in Clive, Iowa. This client enjoyed entertaining but lacked the space for it. This deck created two main spaces for enjoyment. The main area is large enough for a table and chairs as well as the added bench provides additional seating as well as a boundary for safety. The area to the left of the photo was added to be more intimate setting. The floor steps down to provide a space separation as well as to keep the height low enough that railings were not needed. The beautiful cedar and copper pergola adorns this lower level creating a perfect space for a romantic dinner. Trex Composite decking was selected for the floor and we decided to add visual distinction between the horizontal and vertical surfaces by using cedar for railings and skirtings. The floorboards run from the house out to mimic the old porch floors as well as to keep the floor seamless. Hidden fasteners were incorporated keeping the floor looking smooth. This was an excellent project that mixed form, function, and beauty that will last. 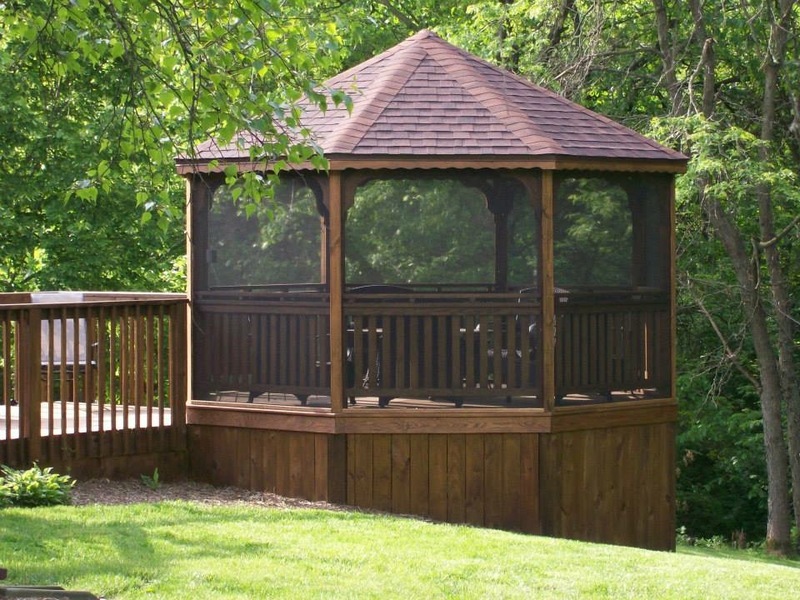 The photo above is for a Gazebo and Deck addition for a client in West Des Moines. Her husband was suffering from the effects of aging and she wanted a comfortable space she could get him to safely where he could be outside to enjoy the birds he loved. The lower deck was in poor shape and held an old hot tub which they couldn’t use. We decided to remove the lower deck and completely replace it with a new ground level deck to match their upper deck. This enabled safe access from the downstairs of the home with only 1 small step. The Gazebo was added to the corner and raised one step up. We screened in the gazebo as well as under the floorboards to keep the insects out. A ceiling fan was added to provide additional comfort on those warm summer days. Lighting and a power outlet enables night time entertaining and relaxing music. We cleaned and stained the existing and new deck and gazebo surfaces to unify the colors and add to its serviceable life. 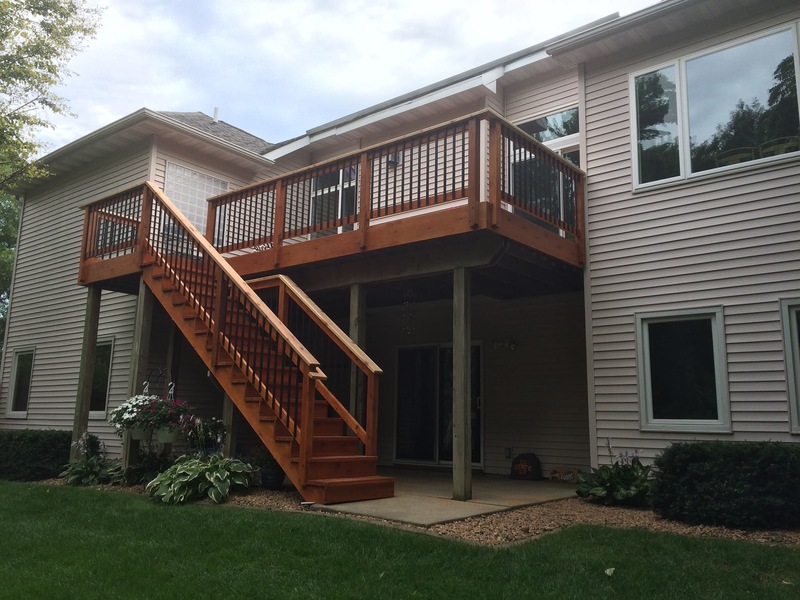 The photo above shows a deck we replaced for a client in Clive. They contacted us about some rotten boards they needed replaced. After a thorough inspection, the amount of boards they needed replaced wasn’t worth the cost of the repair as well as what was the structure like underneath it all. They had issues for years with board rotting out since the area stayed wet due to all the shading from trees. After discussing their options, they elected to do a full resurface with the understanding that if the framing was bad we would replace it. Upon demolition of the old deck surface we discovered the majority of the floor joist were indeed rotting on the top as well as undersized and over spanned. We had the home owner come out to see the damage first hand. So, after we obtained the proper permit we began the total deck replacement. Once all the framing was removed we discovered that part of the floor structure of their house was rotted due to improper flashing. This is an unfortunate common occurrence from decks that were installed over the siding and lack flashing to prevent water from sitting between the deck and the house. 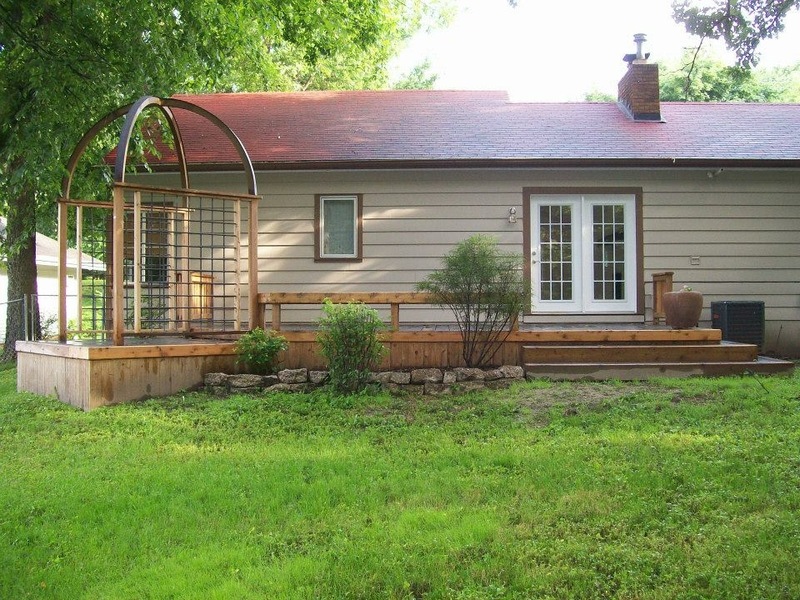 We removed the damaged siding and replaced the damaged rim joist, installed a proper vapor barrier and reframed the deck. The entire deck frame top was flashed with a peel and stick flashing to prevent future rot. Trex Transend decking was selected for its beauty and water resistance and installed with hidden fasteners. We lowered the elevation of the deck slightly to allow for proper flashing to the house and we added the white PVC trim piece to replace the rotten siding. 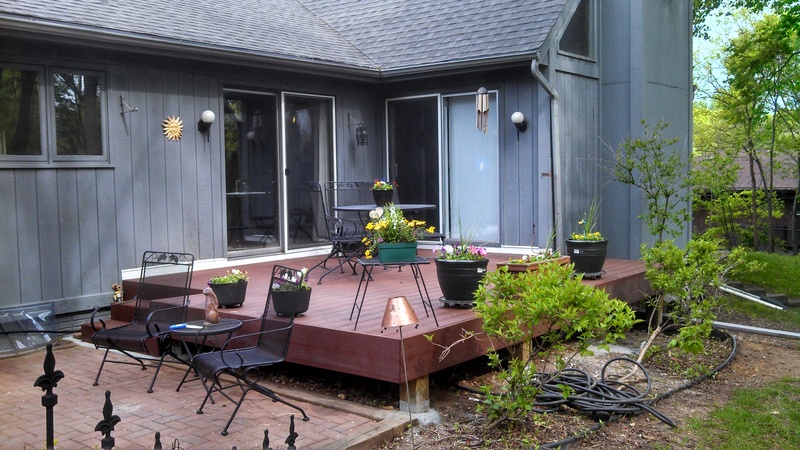 This Client was left with a beautiful, low maintenance deck that should outlast them. The photo above shows a deck repair and resurface project we completed for a client in Urbandale. They contacted us about replacing the hand rails and a few floor boards. Upon inspection we discovered a major safety issue with how the stairs where attached and constructed. It didn’t meet code for when it had been constructed and was at risk of complete detachment. They decided to have us fix it all. We reframed the stairs and added the proper support they needed and resurfaced the deck with cedar. We utilized our basic railing style which is strong, rot resistant and easy to sweep debris off your deck. They chose a black aluminum baluster which accents the stain nicely. Now they have a safe, code compliant and beautiful deck to enjoy. To learn more about our previous work and to check out what our customers have to say visit our testimonials page. If you’re ready to speak with one of our team members, contact Compassion Builders for us to become your preferred Deck Builder today!